AUSTIN, Texas, December 6, 2018 – The Austin Marathon presented by Under Armour is proud to be named a 2018 Champion of Economic Impact in Sports tourism by Sports Destination Management. 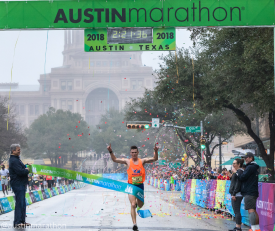 The Austin Marathon, produced by High Five Events, one of the largest privately owned event production companies in the United States, injected $37.5 million into the Austin economy during race weekend, a $3.1 million (8 percent) increase from 2017. High Five Events partnered with the expert faculty at St. Edward’s University’s Bill Munday School of Business to calculate the findings.